Large Oil Measure. Used to measure out oil in quarts which are marked on the side of the can and also by the rings. Just like every other item used by the lighthouse service all brassware was stamped or had official plates affixed to them similar to the one above. Once the Lighthouse Establishment was turned into the Lighthouse Service then all items were marked or stamped USLHS. Quart markings on the side of the large oil measure. 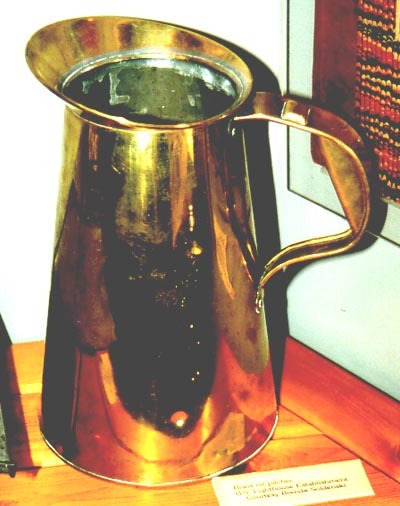 Brass oil cans were a must for every lighthouse in the early days when whale oil and then kerosene were used to light the flame so the light could be seen out to sea. 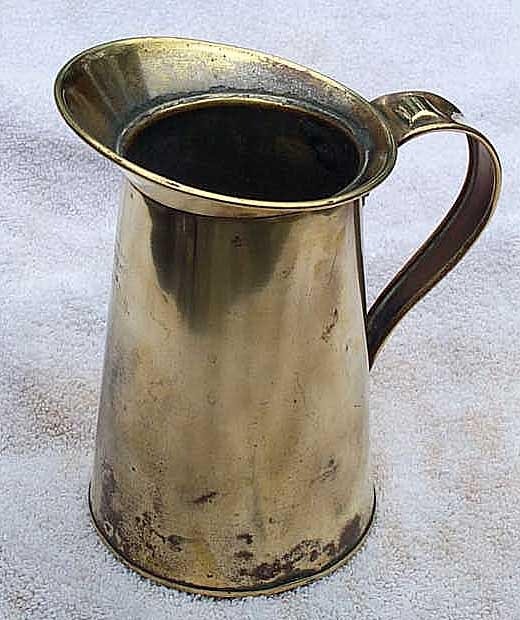 Most brass items were made by the lighthouse service but some were purchased from outside vendors which the lighthouse depot would affix a small tag to designate it as a lighthouse service item. All lighthouse service items were marked or stamped to designate they were for the service and were property of the government. 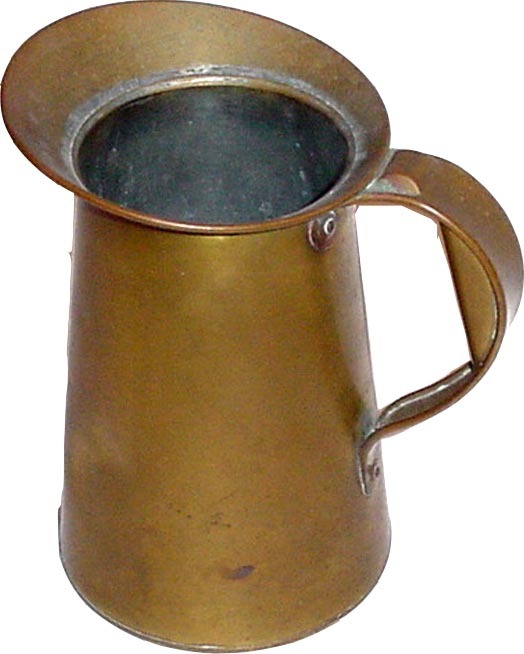 Pictured on this page is a variety of oil measure pitchers. As oil was a precious commodity at the lighthouse its use was carefully tracked by the station keeper who would then report his usage in reports to the district. As oil had to be acquired and budgeted for the government wanted to know how much was being used, compare it to other stations for efficiency, etc. The government would question when things seemed to be out of line. Several oil measures were needed to keep track of what was poured into each lamp or can and for that reason all of these measures exist. 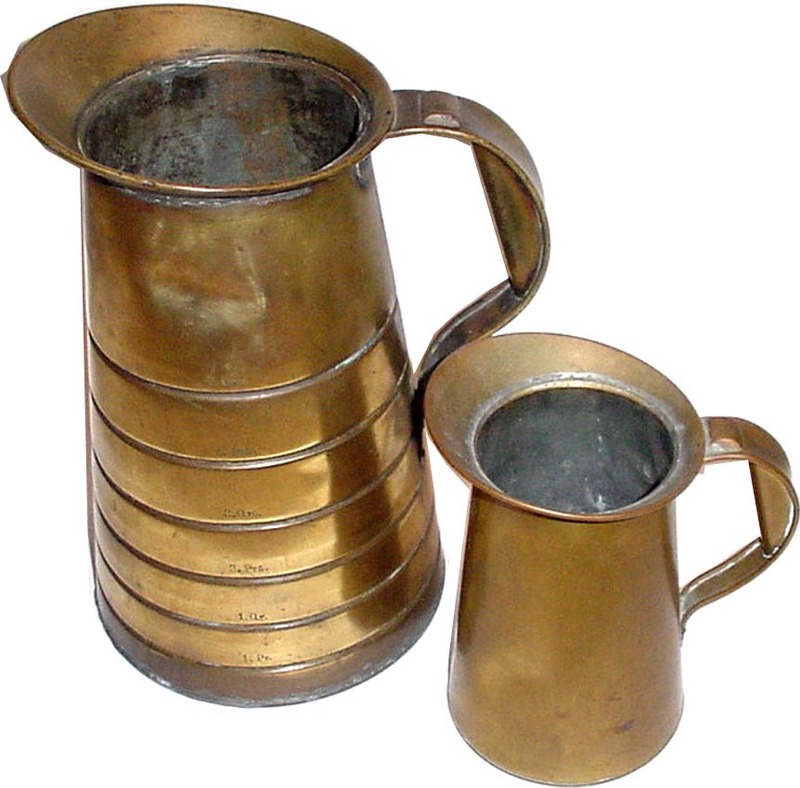 For instance a couple of small oil measuring cups may have been used at a harbor station while at a sea coast light several small and larger ones may have been used to fill the household lanterns and the beacon lamp. We don't know what was issued to each station as that would be determined when it began operation and would be listed in a property return for each station. Some black and white scans of other oil measuring devices will be posted here in the future which will be scanned off a drawing that was done on light keeper implements. This implement drawing is a good reference source for the tools used by the light keepers. This is a medium sized oil measure and is half the size of the larger version pictured next to this one below. Two styles of the medium size oil measure pictured above. Note the differences in the handles. One has more of a grab handle than the other one. Lightkeepers 4 ounce Small Oil Measure. Several sizes existed and this is one of the smallest. This oil pitcher is a 3 quart version without the measuring lines in it. 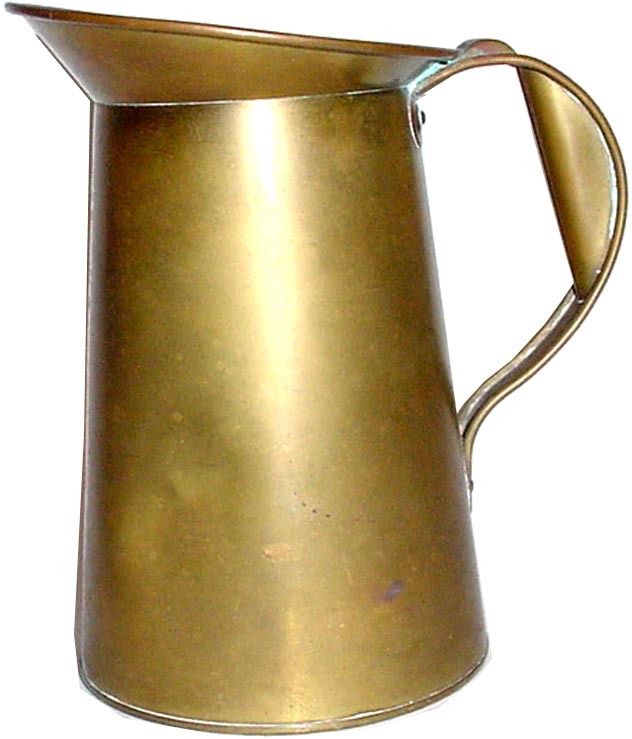 Yet, another version of an oil can.